Day 11 of the 12 Days of Christmas Movies that have fun special fx. Todays pic is the movie The Long Kiss Goodnight (1996), directed by Renny Harlin, starring Geena Davis and Samuel L. Jackson. 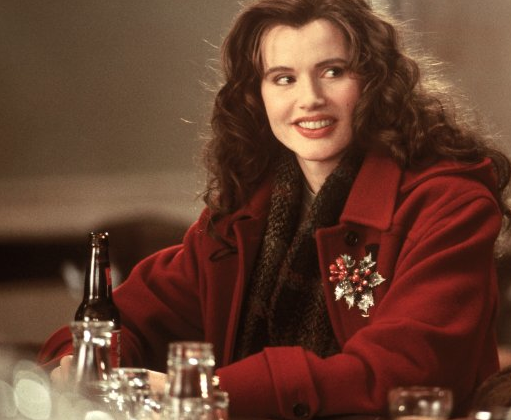 Long before Angelina Jolie played SALT, Geena Davis was a Christmas action hero! I know people talk crap about this movie, but it’s one of my fav Christmas movies. Synopsis: A women suffering from amnesia begins to recover her memories after trouble from her past finds her again. 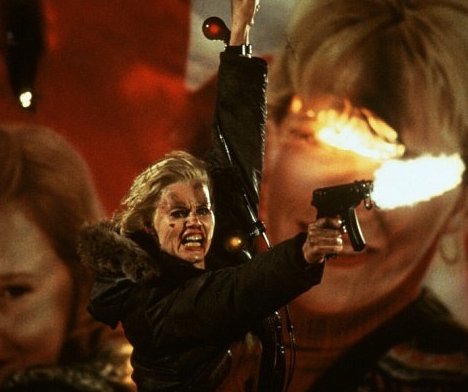 Geena Davis’ character goes from being a mild-mannered mom (and Christmas parade queen) to an a$$-kicking spy. Along with her attitude, her hair color/style and makeup change completely. Which help us believe that she has remembered her past and is back to her old self. Plus, you have all the blood and bruises from the great fight scenes. That must have been fun, fun, fun for the makeup team. Here is a list, from IMDB, of makeup/special fx artist whose work helped make The Long Kiss Goodnight, such a great movie to watch. Russell Cate …. special makeup: FXSmith, Inc.